Galveston’s historic Interurban line between Houston and Galveston. While Galveston and Houston have always been rivals, there has never been a time when wisdom didn’t show it to be in both cities’ best interest to work together. 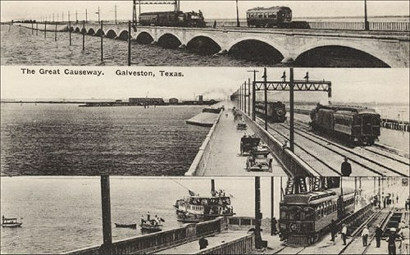 When construction on an electric railway was begun March 28, 1910, to connect the two cities, Galveston had a population of about 40,000. Houston was just twice as big. The new electric train was called the Interurban, a made up word, and it was built in just one year, and that included laying the tracks and building the large plants that generated the electricity that fueled it. The cars, much like trolleys, ran down a single track for just over 50 miles, and at a speed of 60 miles per hour. They hauled passengers and freight from downtown Galveston to Houston and back until October 31, 1936. “Galveston’s historic Interurban line between Houston and Galveston, once the fastest in the nation, gave away last night to the march of time, and ceased operation after 25 years of almost continuous service,” The Galveston Daily News said the next morning. 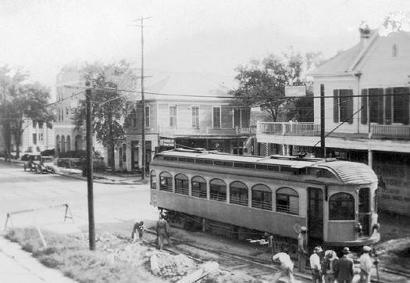 Just three years later, the Houston Electric Co. that owned and operated Houston’s downtown streetcar system shut down. Because the Interurban shared some of its tracks in Houston-proper, through some intercompany trade-out, Houston Electric ended up owning a major portion of the Interurban’s right-of-way that connected Galveston with Houston. To be allowed to shut down, Houston Electric was legally responsible by their contract for removing the tracks. Houston’s Mayor Oscar Holcombe told Houston Electric that rather than pull them up, a task that would be extremely costly, he would let them just pave over them if they would donate the right-of-way to the city. The deal was cut. Holcombe said in 1952, “I felt sure we would be able to use that right-of-way, and equally confident that someday a major, multilane highway would be constructed there.” When the state opened the first section of the proposed super highway connecting Houston and Galveston in 1948, it was built on that right-of way. The Gulf Freeway was officially proclaimed completed in 1952. Four years later, Houston’s first enclosed shopping mall opened. Called Gulfgate, it was anchored by Sakowitz’s and Joske’s. Galveston’s E.S. Levy’s also had a store there. Photo courtesy Liberty Broadcasting Co. 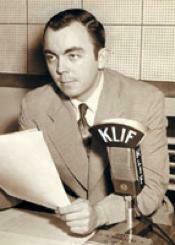 The following year, Dallas’ Gordon McLendon, the radioman who stole broadcasting from network stations with his Top 40 format and personality disc jockeys, bought back Houston’s KLBS, an AM radio station he had previously owned. To build interest in the new format he planned for it, he had a disc jockey lock himself in the shack at the station’s transmitter and play nothing but Ray Anthony’s “Dragnet” for several days before the call letters were changed to KILT and the new Top 40 was introduced. And then with the salvaged frame of an oil derrick he had put on the corner of the Gulfgate parking lot, Don Keyes become a flagpole sitter, attempting to break the world record for KILT. Keyes was not just some silly DJ trying to make a name for himself. He was McLendon’s right hand man in the development of the Top 40 concept from the very beginning, and he had personally come to Houston from Dallas’ KLIF to put KILT on the air and win over the market. The personality disc jockeys that opened KILT included Joel A. Spivak, Red Jones, Bob White, Leaping Lee Perkins and Bill Slater. Shortly thereafter, legend Rascal McCaskill joined as the host of the all night show, “Milkman’s Matinee,” and a few years later one of the now most noted names in Top 40 radio, Chuck Dunaway, was brought in to take over a shift and pump up and stabilize the numbers. Under the name Van Anders, Galveston’s Vandy Anderson did news there for awhile. As unusual as it may seem today, driving to see the KILT flagpole sitter did more to get people from Galveston County to have their first experience with the new freeway and the enclosed shopping mall than any of the advertising and promotions the stores and the mall owners had done. So with the opening of the Gulf Freeway, Gulfgate and the KILT flagpole sitter working congruently, traffic began building faster than anyone had predicted. The highway department built a crude, tripod duck blind looking affair and moved it up and down the freeway from Gulfgate to the Galveston causeway. It kept two employees on top of the thing to take photos of the traffic. Several places along the way, they constructed traffic counter mechanisms that were attached to thermometer-looking signs. This was for public relations purposes, to show everyone how popular the new roadway was. But it was those fellows taking photos from atop the tripod and the traffic count thermometers that were the basis for 100% of the research that the highway engineers used to remold sections of the roadway over the next twenty years. No one had dreamed up a scientific methodology. The advent of Top 40 in Houston; Don Keyes, the flagpole sitter; and the Gulf Freeway being set on top of the old Interurban right-of-way did more to get Galvestonians to explore the world off of the island than anything had before or has since. And McLendon’s KILT, with its zany disc jockeys, fast paced and tight programming, station ID jingles, listener contests and rhythm and blues music, moved teenagers into a dimension that no way reassemble that of the teens of the past.